You'd think that, after nearly three years, we'd exhaust the world of pearls; mais non, cherie: Tahitians! 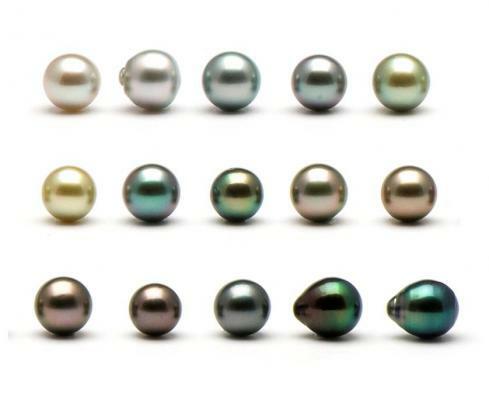 Today and tomorrow, the pearls of Tahiti and French Polynesia, sizeable and sensuously coloured, from cream to palest dove grey to nearly black. The photo of assorted Tahitians above is from the Winterson Journal, written by Winterson, London-based jewelers who specialize in pearls. Be sure to visit their site to see their glowing Tahitians here. This is one of the pricey pearl varieties, and the pearl value factors (size, shape, surface, lustre, colour) are even more important. Those oysters can grow as big as a frisbee, so their pearls are generous compared to akoyas and many freshwaters; 8-11mm is typical, with some vendors offering 12-14mm and above. An increase of only 1mm can mean a 100-200% increase in price. Shown, rare near-round 16.9mm Tahitian pearl from Kojima Company, $835. Tahitians with a deep, rich body colour are more valuable than paler pearls. The most prized is peacock, a rich dark teal colour with overtones that flash colours like magenta with shots of silver or gold. 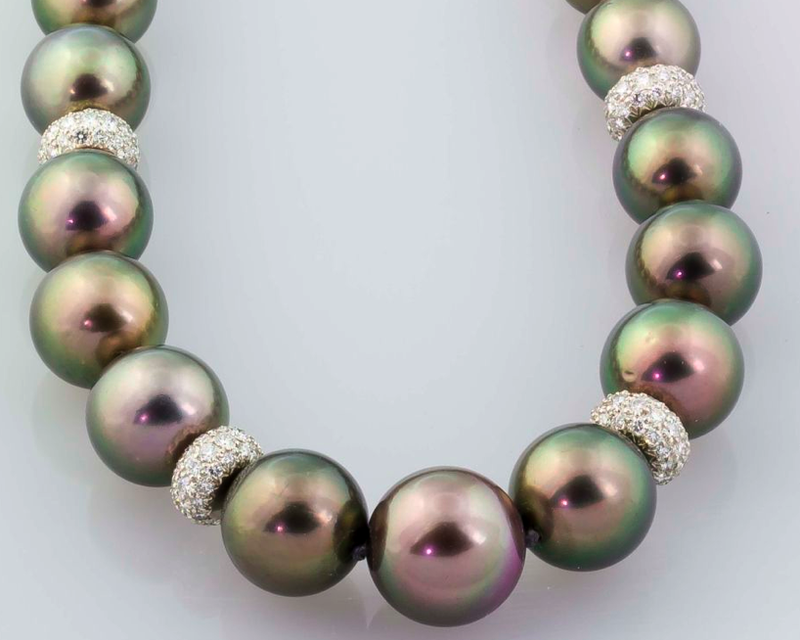 That is a stunning, showy pearl; an entire strand will be very, very precious. 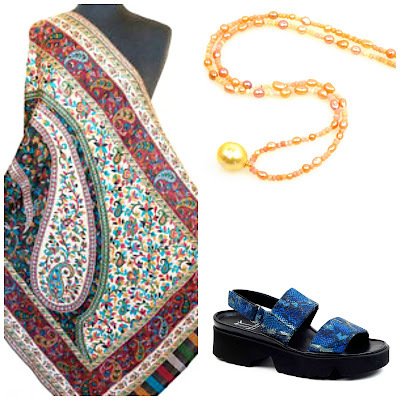 When you hear the term "peacock", ask whether the jeweler is referring to the body of the pearl, the overtone (the play of colour over the surface of the pearl), or both. You might hear the overtone called "orient", the term used when the overtone appears as iridescent hues that move when the pearl is turned, like light catching the surface of a soap bubble. Peacock body colour, which looks like blue-green melded with deep gray, is rarer than peacock overtone, which looks like blue-green tinged with silver or gold floating on top of the pearl (which could be any colour from cream to nearly jet black). Here's the real deal, a vintage strand of Tiffany peacock Tahitians with intense magenta overtones from First Dibs seller Botier; price, $55,000. This peacock business is not the be-all and end-all, though, as there are many other wondrous colourations. Here's a chart of various Tahitian colours, from Miriam Reed of Pearl Distributors. You can see why a quality Tahitian captivates. Row 3: Bronze with aubergine overtones; cherry brown; charcoal; dark green (almost green-black) with mostly green overtones and a bit of peacock overtone; dark green blue with green and silver overtones. 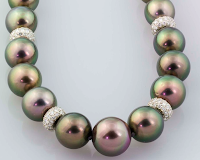 If you go for the darkest Tahitians, make sure there are noticeable overtones or orient on all the pearls or they will look like black beads, quite lifeless. Any pearl needs that breathing, shifting glow over its entire surface to earn your investment. Ask if the colour is natural. Very dark strands (dark charcoal grey to black), copper or "chocolate" pearls are frequently dyed; more tomorrow on that matter. If there isn't a difference in overtones from pearl to pearl, that's another caution light. Too-uniform pearls are likely a dyed batch. Multicolour necklaces are not as expensive as a matched-colour strand. These mixed strands may have pearls of various rare colours (grey flashing with an overtone of teal, for example) that are impossible to assemble for an entire necklace. In this respect, pearls are like diamonds: the absence of any eye-visible flaw drives the price up enormously. Decide what you will accept. I don't mind occasional dents on some of the pearls, but reject pits or splotches. 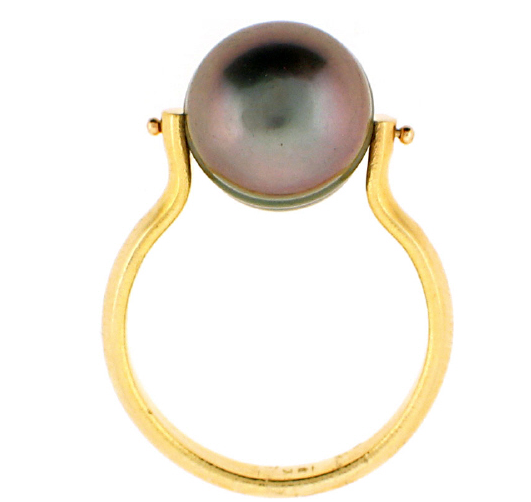 Ringed or "circled" pearls are caused by an interruption in the pearl's growth. I think of them like red lipstick: some women adore it, others avoid. They will be far less costly than other varieties and, if you like circles, don't compromise on colour and lustre. 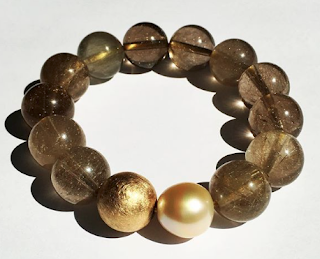 Shown, bracelet of natural mixed colour Kamoka circle pearls; price, $950 from Kojima Company. Tahitian's lustre varies from shiny, almost glassy, to subdued and soft. It's a matter of taste, but because so many costume pearls have that shiny-sharp lustre, I prefer a more subdued glow. You can see the lustre and overtones in this 10.5mm baroque Tahitian ring from Beladora; the pearl revolves on an 18k shank. Essence of Tahitian in a graceful minimalist setting. Price, $395. Thank you for your kind attention; tomorrow, come back to admire more thrilling Tahitians and dive further into their fascinating depths. Wonderful! Thank you - I learn so much from your posts. Thanks for this post. I recently bought Tahitian pearl drop earrings in dove grey as they looked subtly lovely against my cappuccino skin. Loved the deeper colours but probably better for the fair skinned among us. adoyle: I appreciate the encouragement! AN: Your earrings sound beautiful. I think it's more a matter of preference than skin colour. I'm pale white-skinned, and love dove grey too. Also, it will depend on the overtones. There really are no rules. Duchesse, I so enjoy these educational posts. The pearls are beautiful and interesting. What an enlightening read! Some of those you've pictured are truly radiant. Those Tiffany peacocks must be almost otherworldly in person. I'll confess I like the ridged and irregular pearls. The irregularities add a bit of edge. As usual, such wonderful information here, and the photos are stunning. Those Tiffany pearls must be stunning, which they ought to be as they will remain in the land of dreams. Nancy: Thanks for indulging a passion! Pseu: There are circles and circles- more on that tomorrow. Mardel: Some spectacular pearls, for sure. But perhaps a pendant, with one pearlof this quality, would be attainable. There is great pleasure in a single pearl. OOOh Ahhh! I adore pearls, as you know. Wearing my Kojima pond slime coin and keshis today as a matter of fact. Thanks for this post! I have one blue tahitian pearl on a gold wire we purchased in Bora Bora. It is a paler shade of blue than a deep "oil" blue the jewelers thought I was looking for, but it was exactly the color I wanted. We went through many pearls to find my baby. A wonderful remembrance of a restful place. I never tire of these pearl tutorials....in fact it fuels my appetite for more! I agree. I love the pearl tutorials. Your knowledge is so interesting. I confess to preferring the sedate, round, pink overtone variety. But I would mind going quite large:). spacegeek: Oh, would love to see. That's what I'd pick too. I find the midtones, with their shifts of colour most interesting. Gorgeous pearls! I am continually amazed at the range of colours various pearl oysters produce. coffeeaddict: That's why I love pearls, the organic quality and individuality, such natural beauty. 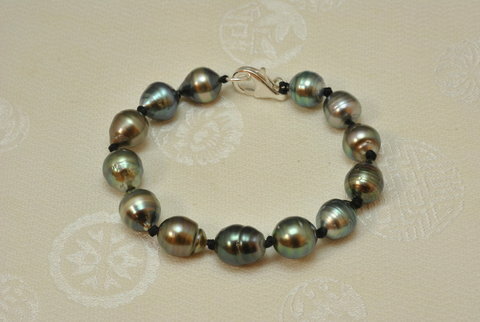 I've lusted after Tahitian pearls ever since I read Tears of Mermaids. The ones you show are beautiful, and I appreciate the "color chart" you provided. I'm echoing what everyone else has said, but I find your pearl posts so informative. Thank you. As a new reader, I didn't realize you posted tutorials on pearls. This one is a gem. Thank you for so generously sharing your pearl knowledge with us, Chere Duchesse! I wore my pale grey blister pearl earrings today and my darker grey pearl and sterling bead bracelet. I find I reach more and more for my more "interesting" pearls for day -- though mine are by no means as luxe as these lovelies. Sewing Librarian: The thanks mean a lot and encourage me! Susan Tiner: See my label list for "pearls" for many more posts. 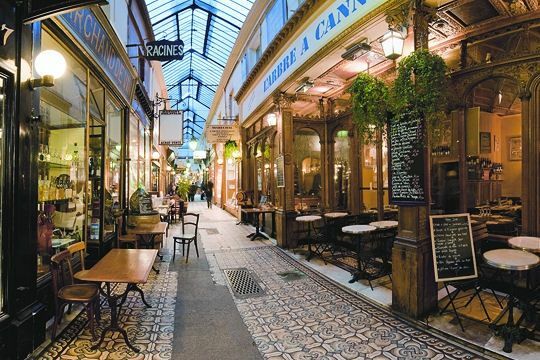 This is "Passage des perles" for a reason! s: Did you ever get those pearls restrung? Rubi: Freshwaters come in pretty greys too, so you can indulge in darks without Tahitian prices. But fine Tahitians are remarkable. I'd ratehr have excellent CFWs than junky Tahitians, and there is a lot of T. junk out there.